The name of the height volume to operate on, usually height. Convert the height values stored in the grid to a polygonal surface. Like "Polygon", but outputs a polygon soup surface. Polygon soups are more efficient representations of dense polygonal geometry, but do not allow most editing operations. 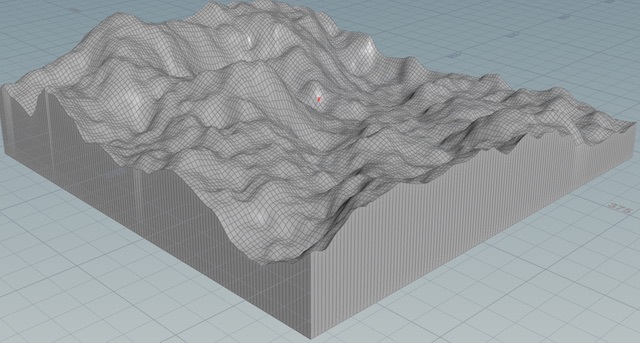 Convert the height values to a 3D VDB volume. Note that this representation takes a lot more memory than a height field. How to lay out the polygons when Convert to is "Polygon" or "Polygon soup". "Rows", "Columns", and "Rows and columns" are probably not useful for terrain data. A ratio between output resolution and grid points in the source height field. For example, a value of 0.5 will output half the resolution (one polygon for every four voxels in the source), a value of 2 will output twice the resolution (four polygons for ever one voxel in the source). Creates point colours using any heightfield material present on the geometry. This provides a close approximation for the output of HeightField Visualization or HeightField Erode. Whether to include an extruded base when outputting polygons. VDB output always includes the base. The height of the base. The direction of the normals created for the base. Flattens the base. If you turn this off, the bottom of the extrusion has the same shape as the top, creating an extruded surface effect.